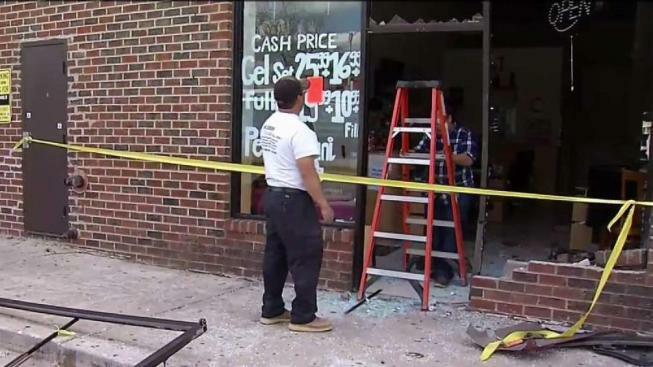 An argument in the parking lot of Maryland restaurant early Monday led to a rampage in which a driver smashed into parked cars, hit people and slammed into a building, witnesses said. He said the rampage stemmed from an argument between one man and two women after the restaurant closed. “To see how many times I witnessed her backing up and pulling forward and backing up, if she didn't mean to do it on purpose, it sure looked like it,” Mundey said. She crashed into TT and C Nail Salon. “She started back up and running in to stuff, and then one of my security guards was trying to get her to put her car in park and she hit him and then she hit two of my promoters and then she hit a young lady,” Mundey said. No one who was struck was seriously injured. A nearby business owner, Robert Graham, said his work truck was damaged. But his property fared better than some others. The nail salon was closed for business Monday. “I do feel that she had the opportunity to pull off or make a different approach,” Mundey said. The driver is facing a number of traffic charges, and there could be more charges depending on the outcome of the investigation.